I have wanted the Frank Thomas 1990 Topps NNOF (No Name of Front) for many years. I discovered this card’s existence in the mid 1990s and never saw one in person until I acquired my copy in March of 2013. In recent years, this card has really climbed the charts in terms of value. It has moved up even more since Frank Thomas achieved baseball Hall of Fame status on January 8th, 2014. 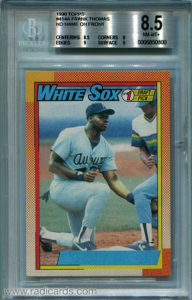 I can’t say, however, that this is one of the rarest Frank Thomas cards because I see these hit eBay pretty routinely. I will say this, however, hadn’t there been an eBay, this card would indeed be one of the scarcest Frank Thomas cards. Let’s work a statistical analysis on this card. Let’s consider some assumptions and look at the population reports from the two major grading companies for the Frank Thomas 1990 Topps No Name on Front (NNOF). BGS, and PSA. Also, to keep our math clear we'll assume these numbers don't account for examples that have been cracked out of their slabs and resubmitted since there's no way to track that. That said as I write this, the following numbers have been recorded. Combined, 235 examples have been graded and as such have been confirmed to exist. Let’s assume that there are 50 more examples to account for those graded by other grading companies, and raw examples. That brings us to a total of 285 examples. Now, let’s look at total production numbers for 1990 Topps baseball. These cards were released in a number of different fashions i.e., cello , rack , vending , and wax . For convenience, we’ll use numbers associated with the 1990 Topps wax pack. For this study, I’m going to benchmark with the 125,000 case production run that Upper Deck produced for its inaugural 1989 release. This number was indicated on page 131 of the book, Card Sharks: How Upper Deck Turned a Child's Hobby into a High-Stakes, Billion-Dollar Business , which is an insanely good read. With that number, let’s continue crunching. Now that we have a total production run, and an estimated number of NNOFs, we can calculate the total production percentage for the NNOF. Next, we need to solve for X in the following equation, where X is the total number of packs you’d have to open, and Y is the odds of pulling the card. So far, we've established that to guarantee a pull of the Frank Thomas 1990 Topps No Name on Front (NNOF), we'd have to purchase 315,856 packs, which equates to roughly 8,773 boxes, or 439 cases. At the time of this writing, a case of 1990 Topps wax boxes sells for ≈ $250. Let’s say it takes you 20 minutes to open a single 1990 Topps wax box . Let’s make an adjustment to this equation so that we divide 2,924 by 8 to account for a realistic full work day. Our equation comes to 365.5 ≈ 366. To pull the Frank Thomas 1990 Topps No Name on Front (NNOF), you would have to open wax packs of 1990 Topps for 8 hours a day, without any vacation or holiday breaks for 366 days straight, which equates to 1 year, and 1 day. Based on my constraints, to pull the Frank Thomas 1990 Topps NNOF , you’d have to spend $109,750 on 315,856 wax packs (439 cases) of 1990 Topps , which would take you 1 year, and 1 day straight to open if you dedicated 8 hours a day. Frank Thomas isn’t the only player whose ’90 Topps card can be found missing black ink. There are several other cards from the early print run that suffered similar fates. With an ambitious pursuit of knowledge about how these errors were created, advanced collector and hobby researcher, Ross Clark of BigHurtHOF.com has crafted a theoretical analysis of the origin of these legendary blackless errors. Thanks for the comment! 🙂 I know it seems unlikely but actually the NNOF has continued to appreciate over the years and in my opinion, I don’t ever see it slowing down. This is one of the most iconic error cards in the entire hobby and I believe there will always be a demand for unopened 1990 Topps wax due to its direct association with, and chance of pulling the card. Great article, I love the numbers but do have a question. Is there any possibility many of the BGS and PSA cards were resubmitted or transferred from one company to the other without removing from the others population? I love this article. What a special card. I’ll never forget the day my brother and I both got a pack of Topps (They were the cheap cards back then and I wish we could have been getting Upper Deck cards). My brother pulled the NNOF right out of the pack. He knew it was cool, but his obsession was with Bo Jackson, so I traded him a couple Starting Lineup statues and a couple cards for the NNOF. I wish I would have protected it better from the beginning, but I was just a kid. I dug it out not too long ago and and it has been protected pretty well. Now I guess it is time to get it graded. You can add 1 more confirmed NNOF to your statistics. I HAVE A QUESTION . ALTHOUGH I MAY HAVE LOOKED OVER IT IN THE STORY. I AM JUST WONDERING DO THEY KNOW THE ODDS OF PULLING ONE FROM A RACK BOX . It’s my understanding that the general consensus is the NNOFs are only found in wax and jumbo cello packs. That said, odds of pulling one from a rack pack wouldn’t exist. i had heard the only place to find a NNOF was in the Jumbo Rack packs of 106 cards. i can not verify that but it is the story i was told. I’ve heard they’re found in Jumbo Cellos (Jumbo Rack) too but I’ve also heard they’re found in wax packs. While I can’t confirm with certainty, it’s my understanding those are the only two formats they’re believed to be found. Thanks for reading and commenting. You are leaving out the fact that there are cards out there that aren’t graded. I understand that estimating how many of those exist would be a complete guess and I really do think that cards behind regreded had a bigger impact on your numbers than you think it does. While I agree there may be some number of ungraded examples more than my estimate, given the total output of 1990 Topps, I still don’t think that number would have any significant impact on the equation showcased here. There just aren’t enough of them. There’s no way to measure how much has been ripped. I have one in my collection from my childhood days wonder what it’s worth?